Here at USGBC we often say that green building sits at the nexus of saving energy, saving people and businesses money, and creating jobs. Yesterday our friends at Environment America put that powerful combination of green building benefits into their own words. 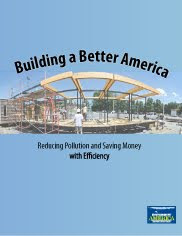 The organization, made up of a vast federation of state-based, citizen-funded environmental advocacy groups, released a new study showing how green building is all about…well, the title of the report: Building a Better America: Saving Energy and Money with Efficiency. The report details a set of policy opportunities that could help accelerate green building - so much so it could save American families $450 every year in energy and reduce greenhouse gases by 30% from buildings. What does that mean, though? As the report points out, that’s the equivalent of taking 320 million cars off the road. “It’s time to build a better America by investing in efficiency,” said Courtney Abrams of Environment America during the launch of the report. “Bold efficiency measures that slash energy use in our homes and businesses can reduce pollution and save consumers money. The best part about making energy efficiency improvements is that they pay for themselves as consumers enjoy lower energy bills and a cleaner environment year after year,” said Abrams. The report also reviews the leadership that the Obama Administration is showing to promote green building across the country and highlights successful efficiency programs and incentives at the federal, state, and local levels. So I’ll say it again. There's is no greater, more compelling and more cost-effective opportunity to save energy, cut emissions, improve energy security, and drive investment in the U.S. economy than energy efficient, green buildings. Ultimately, this report highlights how sound policy measures can accelerate the transformation we need towards cleaner, greener buildings today and a more efficient and resilient economy tomorrow. Simple trick to cut your electricity bill by 75% - DIY HOME ENERGY.